Alright then, the all new KTM Duke 250 has been launched in India, and it looks damn exciting. Regulars here would remember that Motoroids was the first to get you guys the um,mnn,mn,n,mnndisguised images of the motorcycle prior to launch and also the news that it was, indeed, slated for an Indian launch what with the saree guard and all. 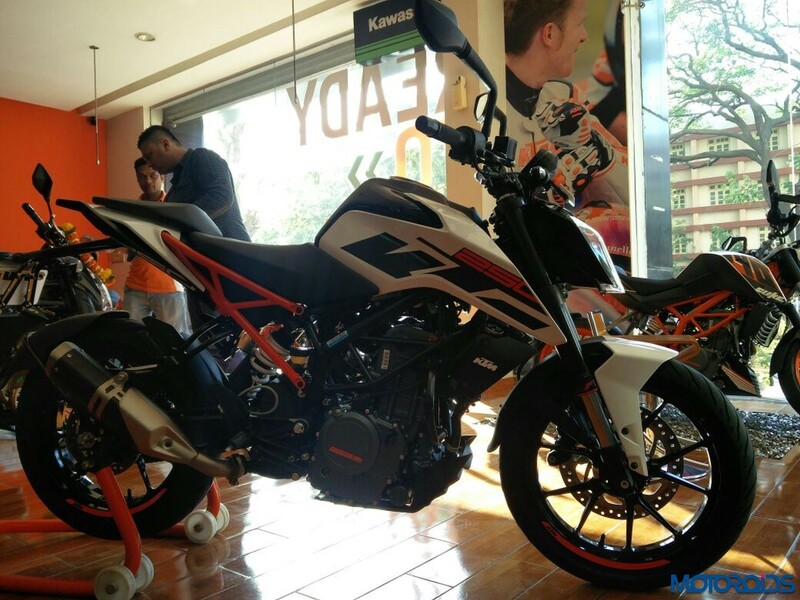 So now as the launch has happened, we made a quick trip to a nearby KTM showroom to have a look at the bike up close and bring you the most detailed ‘all you know’ feature you’d find anywhere on the web. 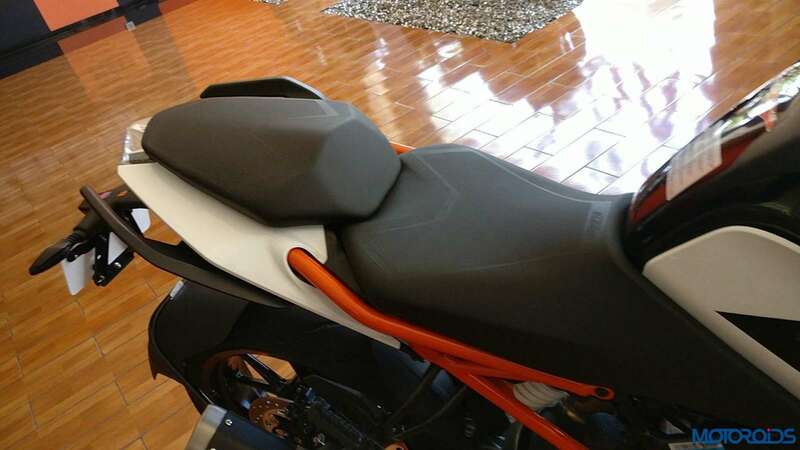 So here’s the all new KTM Duke 250 deciphered to the last detail for you. Let’s get done with the pricing first. 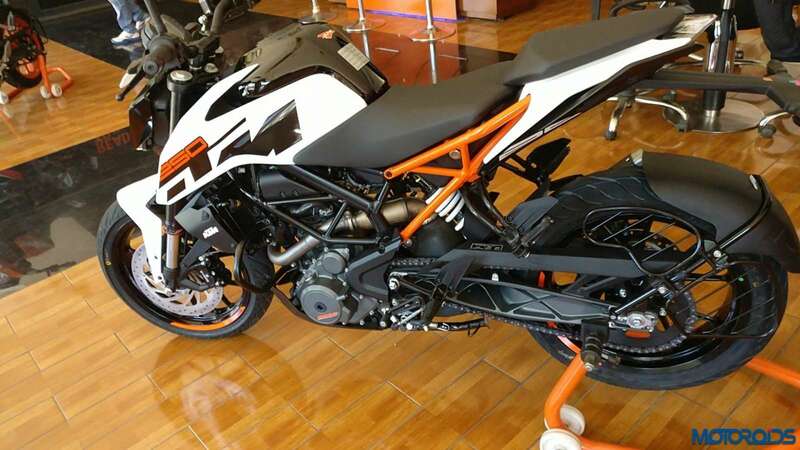 The KTM Duke has been priced at INR 1.73 lakh ex-showroom Delhi. For Mumbai, the OTR price of the motorcycle is INR 2.0 lakh. 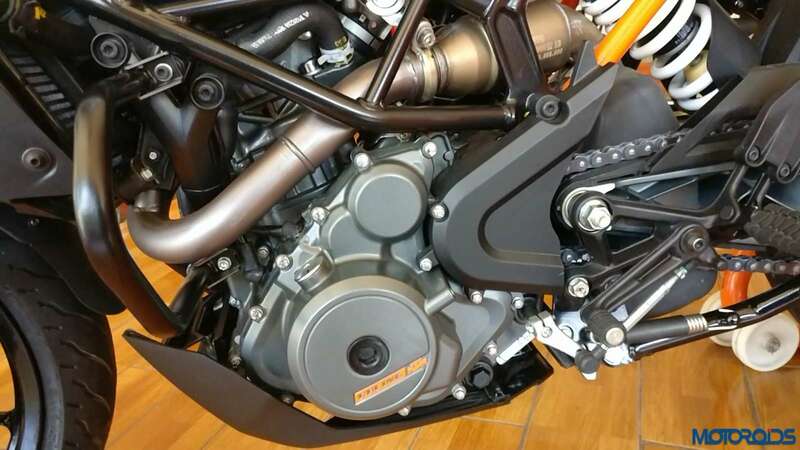 The KTM Duke 250 has taken its design inspiration from the 1290 Superduke which is also termed as the most powerful naked in the world. The 250 Duke is powered by a 248.76cc single cylinder engine. Power on this one is rated at 30PS @ 9000 rpm and 24 Nm @ 7500 rpm. Power is up 5 PS and torque up by 4.8 Nm over the 200. Transmission is taken care of by a 6-speed constant mesh unit. This engine is a brand new unit as is evident with a totally new engine casing. Don’t mistake this one as a re-bored version of the 200 though. Being a new engine, we expect it to have advantages in terms of refinement and performance as well. We will get you our word on the new bike very soon as we ride it. The bike gets slipper clutch which the 200 doesn’t. This is a significant difference and should make the Duke 250 a much more desirable motorcycle while going corner carving and kicking down with gay abandon around those sharper bends. The bike gets a new dedicated trellis sub frame bolted on, which should make the Duke 250 handle noticeably better than the Duke 200. Wait for our review for the final word on that aspect though. The paint on the Duke 250, as is the case with all 2017 KTM machines, is of a new variety which is more resistant to UV radiation, and thus offers more durability and resistance to fading. 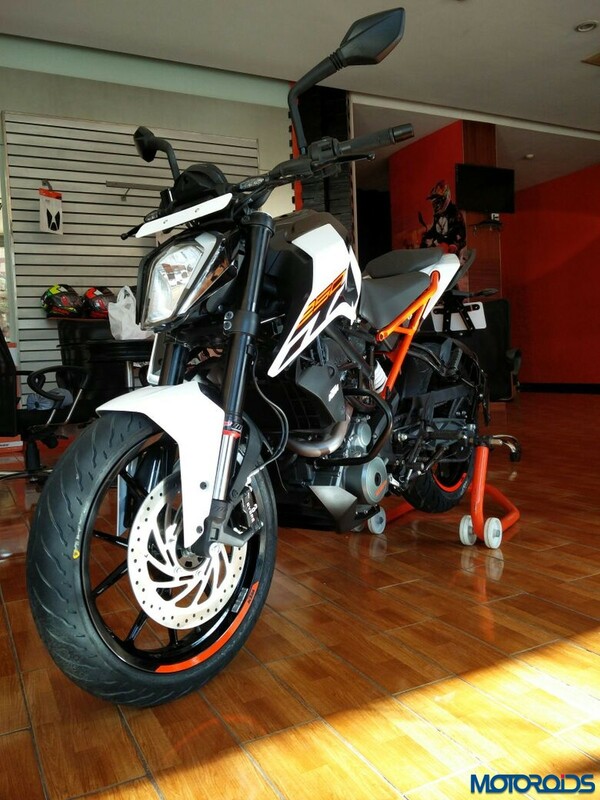 The Duke 250 is available only in White and Orange shades unlike the 200 which is available in three shades. At the rear, the Duke 250 gets a newly styled set of lamps housed in clear lens unlike the 200 which has a red coloured tail lamp. The split grab rail on the Duke 250 is differently styled as compared to the Duke 200, and looks more stylish. The tail unit, which extends beyond the tail lamp is also new and is different to the one on the Duke 200. The rear WP shock absorber on the Duke 250 gets a special mud protection cover, which it shares with the bigger 390. The 200 doesn’t get this feature. The seats on the Duke 250 are all-new, and have been improved keeping in mind the feedback from a lot of Duke 200 and 390 riders. It is better contoured and offers much better cushioning for more comfort over longer distances of travel. 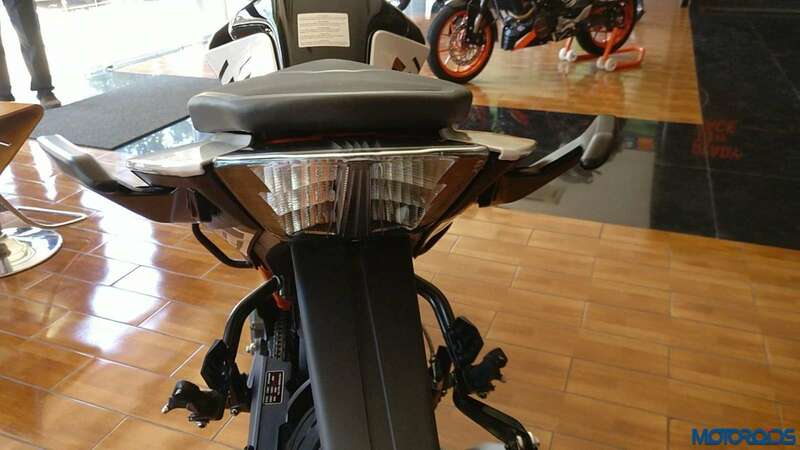 The design of the radiator grille on the Duke 250 is all new for more efficient cooling. The panels on the sides of the radiator grille with Duke 250 branding are also exclusive to the Duke 250. Front brakes on the bike are the same as the Duke 200 though, with 300mm dia. The brake and clutch levers on the Duke 250 are differently designed and are apparently better to use too. The electric starter on the Duke 250 is of the electromagnetic variety, so you don’t need to keep pushing it. Just press it once, and it will take care of the rest. 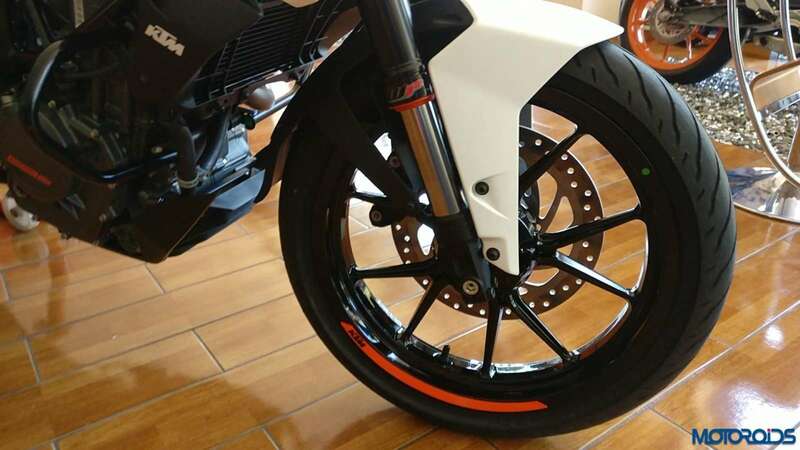 Front fender on the Duke 250 gets all new styling and is painted in a two tone scheme. It bore white and black shades on the white coloured motorcycle we videographed. The front upside down forks now get new fork seals which have been made by SKF Japan, and have been imported. 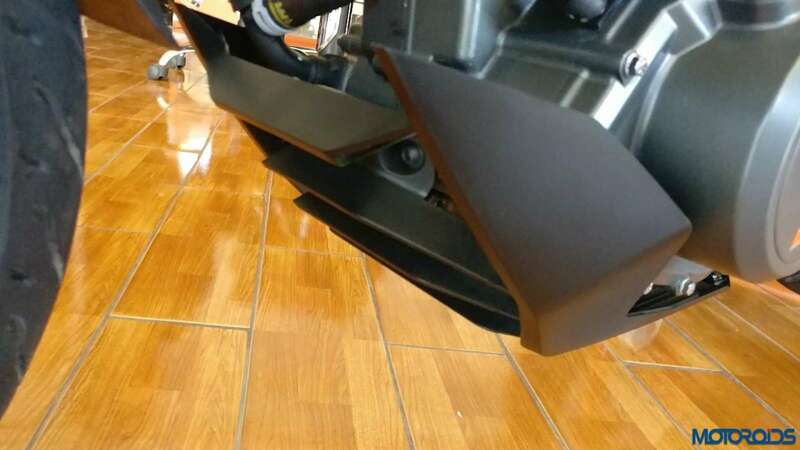 These are of a higher quality than the ones available on the previous 200 Duke, and should offer better resistance to leakage and should ensure more durability. 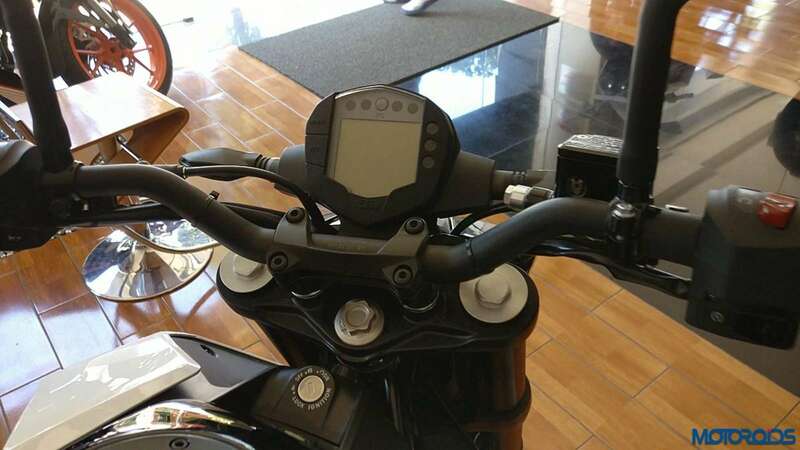 The position of the ignition slot is closer to the rider, right ahead of the tank, unlike the Duke where it’s closer to the handlebar. Talking of the handlebar, the unit on the Duke 250 is painted in black unlike the silver shaded unit of the 200 Duke. The Duke 250 also gets bar end weight which the 200 Duke doesn’t and also has a different design for the bar grips. Switchgear and instrumentation on the two bikes remains the same though. The Duke 250 gets a full metal tank and doesn’t have a plastic cover like the Duke 200. The tank capacity is 13.4 litres which is up by 3.3 litres on the Duke 200 and should endow the Duke 250 with a better range. The side swung exhaust on the Duke 250 is significantly different from the one on the Duke 200. This one here has been engineered keeping the centre of gravity and handling in mind and KTM claims that the one sided exhaust hasn’t negatively affected the handling of the motorcycle. The Duke 250 gets steel braided brake lines, same as the 200 – the brakes on the two bikes are same, too. 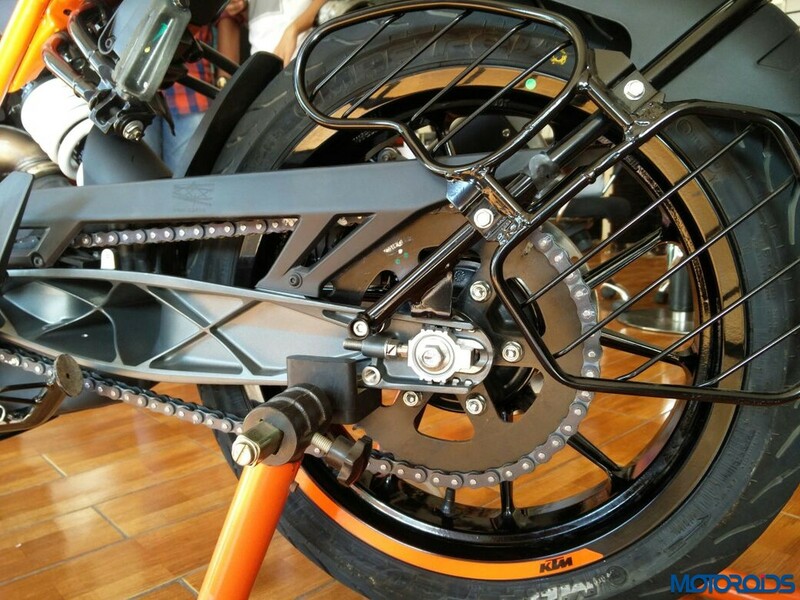 In all, the KTM Duke 250 isn’t just a rehashed 200. It’s a brand new product which offers significant advantages over the 200 in terms of styling, product generation, engine, performance, chassis, mechanicals and overall appeal. It really slots itself snugly between the 200 and the 390 Duke as a properly distinguished model and is a very appealing proposition in our opinion. The real difference in terms of performance can be gauged only when we ride it though, and trust us to get back to you with a detailed road test review very soon. So stay tuned! Do you have any opinions or queries about the new product? Do let us know on the Forums.